The ferritic stainless steel pans from SOLIDTEKNICS are built to last a lifetime. 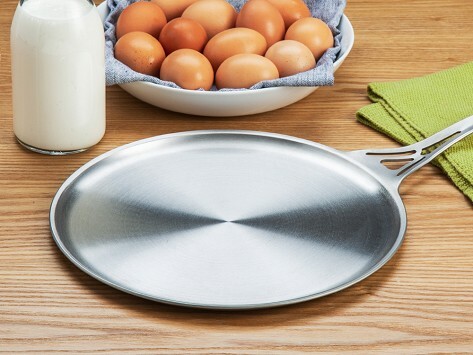 Made in the USA from U.S.-sourced steel, the flat skillet heats up evenly and faster than an aluminum pan. A seamless one-piece construction boosts its durability—no screws or rivets, or gaps for build-up to collect. The pan works with a variety of heat sources and can go into the oven, onto an open flame, and cleans up in the dishwasher. This sleek skillet can pull double duty as a lid for the SOLIDTEKNICS sauteuse pan, too. Dimensions: 18.25" x 9.7" x 1.3"